The Ruby Fund — Casey Crosby. Pianist. Casey has always been and is a big animal lover and supported in the past many different animal welfare organizations as well as shelters. He decided to donate a part of the profits of his new album “November” to support the work of animal charity organization or local shelters. The name of Casey’s animal charity project is “The Ruby Fund”. When Casey was looking for a cover photo for his new album “November” he had a somewhat clear picture in his head how it should look like. When searching online, he came across a beautiful photograph of Marlogue Wood (Ireland) and was immediately intrigued by the mystic beauty of the picture. The picture perfectly suits the foggy magic of the month November and is excellent as cover picture of Casey’s new album, since Casey has a song called “Marlogue Wood”. It happened that the Irish photographer of the picture – Bernie Carney – had a dog named Ruby who unfortunately passed away. She also had taken a picture of Ruby in exactly the same spot in Marlogue Wood where the cover picture of “November” was taken, just with Ruby sitting there. In memory of Ruby, Bernie wrote a tribute to her beloved girl, which you can read below. Touched by the unconditional love for her dog, Casey purchased not only the rights to use the picture of Marlogue Wood but also the picture of Ruby and decided to call his animal charity projects in memory of Ruby “The Ruby Fund”. Casey war und ist ein grosser Tierliebhaber und hat in der Vergangenheit viele verschiedene Tierschutzorganisationen und Tierheime finanziell unterstützt. Einen Teil des Verkaufserlöses seines neuen Albums „November“ möchte er Tierschutzorganisationen und Tierheimen zugutekommen lassen. Der Name seines Spendenprojekts ist „The Ruby Fund“. Als Casey ein Coverbild für sein neues Album „November“ suchte, hatte er ziemlich klare Vorstellungen, wie es aussehen soll. Als er online nach einem Bild suchte, fand er das wunderschöne Bild von Marlogue Wood (Irland) und war sofort fasziniert von der mystischen Schönheit des Bildes. Das Foto zeigt die neblige Magie des Monats November und ist perfekt als Coverbild für Caseys neues Album geeignet, da Casey auch ein Stück mit dem Titel „Marlogue Wood“ hat. The irische Fotografin des Bildes – Bernie Carney – hatte eine Hündin namens Ruby, die leider verstorben ist. 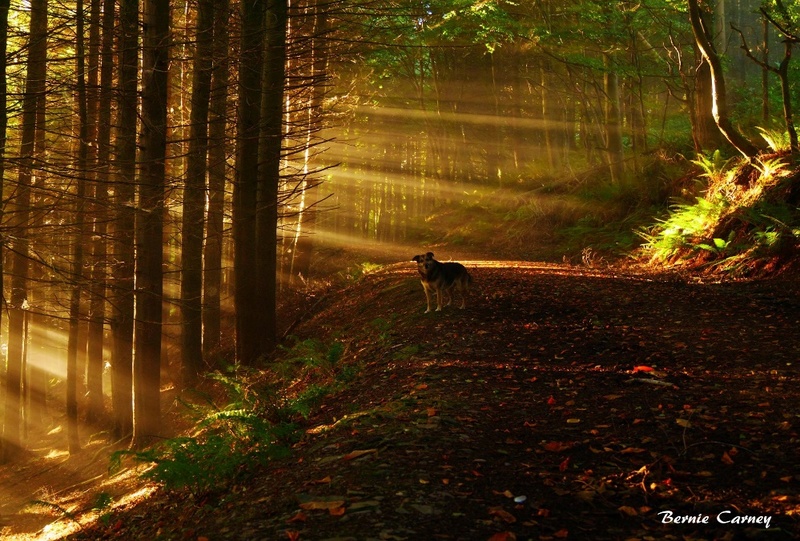 Sie hat Ruby am gleichen Ort im Marlogue Wood, wo das Coverbild von „November“ entstanden ist, fotografiert. Als Erinnerung an Ruby hat Bernie einen Text abgefasst, dessen Übersetzung weiter unten zu finden ist. Berührt von diesen Worten hat Casey nicht nur die Rechte am Bild von Marlogue Wood, sondern auch am Bild mit Ruby erstanden und beschloss, seine Spendentätigkeit für Tiere „The Ruby Fund“ zu nennen, als Erinnerung an die geliebte Hündin. "As I carried you many years ago, for the first time in my arms, I looked into your deep, brown eyes and somehow the crackle of our energies met and we understood each other. I recall you standing on the quay wall, tail wagging and head tilted downwards. With excitement, you side stepped and danced happily as you observed the silver showers of Sprat breaking the blue waters and the slow meandering glide of Mullet beneath the glassy surface. These things you saw and with bright eyes, you shared them with me using mere glances that sliced through all else occupying my busy mind. As you grew past those early puppy years, you took the time to learn me. You knew my every thought, my every word. You seemingly pre-empted my every move. You stole my heart and it a willing prisoner, embraced and embodied your love for life. We wandered, you and I, through fields in sunshine and in rain. You, running ahead, zig-zagging through furrows and well-worn tractor tracks. On Summer days, we sat back, sometimes lying on the warm earth as we drank in the song of the Skylark, watching the swooping of Swallows, listening to the mewing of Buzzards as they circled upwards into the blue sky, rising higher and higher until we could see them no more. I ran my hand over your soft head, stroked your velvet ears and felt the warmth of the sun which had soaked into your thick dark fur. Your eyes are amber now, they lightened as you aged and the summer sun is reflected in their drowsiness as you patiently wait for me to move and carry on our adventure, our stolen moments from life and its many demands. It was you who taught me how to see. 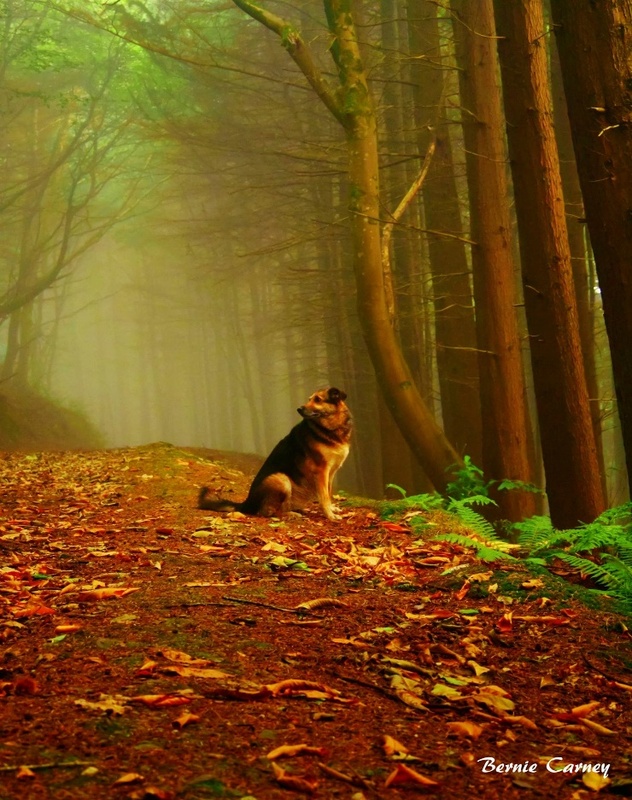 I watched you as you sat on woodland paths, sometimes enveloped in swirling autumn mist. I observed the tilt of your head, the slight strain of your ears. You inhaled the scent of the damp, leaf mulched earth and then raising your jaw, noble looking and intense, you sniffed the air, searching further then the loamy earth. You added to your matrix, flora and fauna alike and went beyond that to imbibe the tangy sun-dried seaweed on the far shore and tasted the salt carried through the trees from the sea. Added to this, you listened for the scurry of little feet, the scamper of a squirrel, the soft downy fleeting shift of feathers as birds shuffled on branches above. Far, far away a Pheasant rises out of ripened barley and you hear this too – because you do, I do too. On cold, bare wintry days, we made our way across the grey stony strand. My nose red and cold, our breath frosted and hanging in the air highlighted by pale, yellow, watery sunlight. You are ahead of me as always, a few steps only, never out of sight. You turn to meet my eyes and I know you are telling me of what lies ahead. I follow your gaze and sure enough, across the strand and two brown, stubbled fields away, I see a ball of orange in a patch of straggly grassland. A fox, resting and relaxed, lies sleeping. You stop and watch me watch. I smile, grateful for the tip off. Out of the corner of my eye I see the wag of your tail and a twitch of your whiskery muzzle tells me that you are content. Oh, to be so easily pleased, to find joy in just this simple act of giving. Surely this is all we need to aim for in this troubled world. Often, we walked in the dead of night to the Camber below our house and under the night sky in varying phases of the moon or differing weather patterns, we shared so much. The Grey Herons standing statue like at the seashore were unperturbed by the feral cats fishing beside them, paws paused over the water, ready to strike just like the beak of the Heron, both species opportunistic and ready. Sometimes as we strolled down the winding pathway, the wind carried the sound of chirping Otters and you, excited and full of zeal, met my eyes in recognition and hurried your steps towards them. We sat watching them slip downwards info the satin black water and they acknowledged us now and again with curious glances as they popped up for air, playfully squeaking. On the pathway home, out of the urban undergrowth, we met many times, our princess of the night, our vixen with her beautiful brush tail. She would oft times pause as though to say hello and then she’d disappear beyond the walls of the old fort, a faint yap beyond indicating that she was not alone. If I am to recall our perfect hours, one time stands out. It is the sight of you bathed in golden sunrays. You are, in this moment, a fantastical, mythical creature and it seems only fitting that you should be wrapped in this fine light, the very first, fresh illumination of a brand-new day. You belong in this scene, in a sylvan paradise of whispering leaves, at one with all that is natural and pure and lovely. We have said our Goodbyes now and in a strange coincidence, your last days included one lucid moment on a rare day on which you felt well enough to walk. We are once again on the quay wall and suddenly in the midst of your slow amble, you lift your head and looking downwards into the clear blue water, you see silver sparks as countless Sprat break the surface. You pause to look at me and I smile. ‘I see them’, I say, as we gaze down and see three Mullet lazily slice through the silver shoals. I feel elated, my heart about to burst and full of hope but it doesn’t last. As we stroll along the waterfront, the clouds low and grey and heavy with rain, you slow down, your head hanging now and your ears down turned. You stop, exhaling heavily and lift your lovely face to mine and your eyes, I see are tired and clouded with pain. I cannot carry you now as I once did when you were a small black and gold ball of fluff with deep, brown soulful eyes. I cannot carry you, so I let you rest a while and a tear falls slowly down my cheek – you hear it, the change in my breath and you look up and meet my gaze. Words unspoken, as always, are shared and I prepare to say Goodbye. I sorely miss you my dear, dear friend but I will never forget the things that you taught me. I will always endeavour to see in the way that you taught me to see and to hear the things you taught me to hear."